Taken May 2005 at Los Alamos. History: Originally part of Loop NM-4, designated in the 1970s as a business loop through Los Alamos. Redesignated as a separate route in 1988 and divided into NM-501 and 502. Taken May 2005 east of Los Alamos. History: Originally the east part of Loop NM-4 through Los Alamos and NM-4, which was renumbered east of the junction with the Los Alamos loop in 1988. History: The easternmost segment of former NM-4, renumbered in 1988. History: Established around 1960 when an existing road west to the Four Corners area was paved. 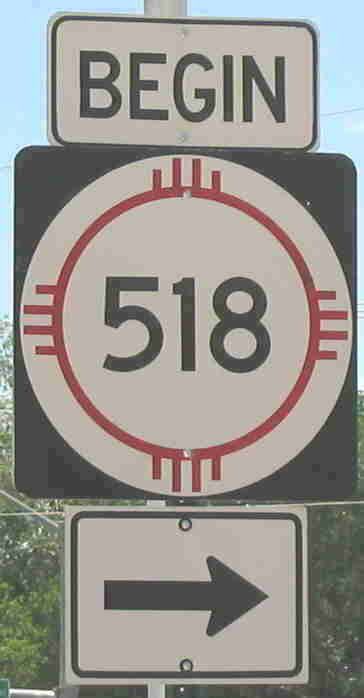 After establishment of U.S. 164 (which became 160) in the mid-1960s, the connecting Arizona route took the same number as this road. Around 1990, U.S. 64 was extended from Farmington west to Arizona over this road, and the state route number was eliminated. Improvements: The 2003 New Mexico highway map shows the entire route as paved, two lane road. In 1999, the western half was apparently gravel. 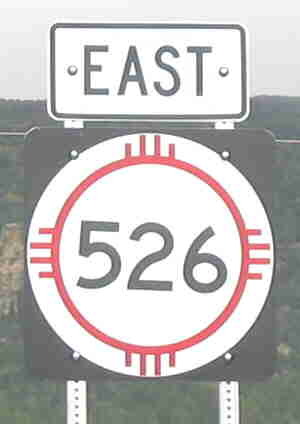 Comment: The route probably ends at NM-445 (old U.S. 85), but the I-25 exit just south of this junction is marked NM-505. History: Its state route log history indicates it was established before 1983. Thus, due to not being shown on other maps probably established c. 1980. 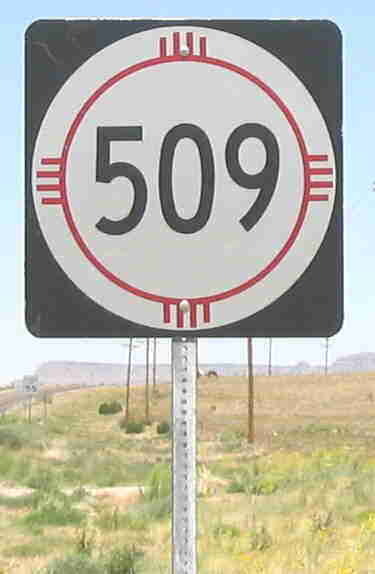 A field report by Bobby Magill indicates that the road is now marked Otero County 506. It still shows on the state highway log, so it might be county road at this point. Comments: This is a logical route to have turned back to the county. Interestingly, Mr. Magill also noted a "US 506" marker on newly widened U.S. 54 (obviously an error by the highway contractor). History: First indicated on the 2003 New Mexico highway map, but due to its short length was probably not shown on other maps. Probably established pre-1988 due to its number. History: Established around 1960. Route unchanged since that time. History: Established around 1960 north to Ambrosia Lake. Route extended north around 1990. East terminus: NM-589 (Cerrillos Road at Paseo de Peralta) ?? History: Date of establishment and removal, and actual length not known. Comment: This shows on on-line maps only, and the extent of the route is not consistent. I know that NM-14 replaced U.S. 85 along Cerrillos Road from I-25 to St. Francis Drive (U.S. 84-285) in the 1980s, so this route can not have ever run down Cerrillos Road west of St. Francis as these maps show. The only realistic portion of road this could have occupied is shown above, unless it ran through the Plaza and back along Old Pecos Trail to NM-466 at St. Michaels Drive. History: Established around 1960 northeast to Navajo Dam. Route extended north to the Colorado border around 1970. History: Not shown on any map before 1995, but due to its short length the date of establishment is uncertain. History: Due to its short length the date of establishment is uncertain, but probably pre-1988 because it would otherwise be a 3xx number. History: I never saw this on a map, so the dates it existed are not known. Comment: This route is referenced in the state route log as the former use of NM-514. No dates of usage are provided. History: Appears to have been established around 1980. Not shown on earlier maps, but due to its short length it may not have been shown. History: Date of establishment not known. Turned back 1988. History: The original route of U.S. 550 (and before that, in the early 1930s, NM-19) from Aztec to Farmington. 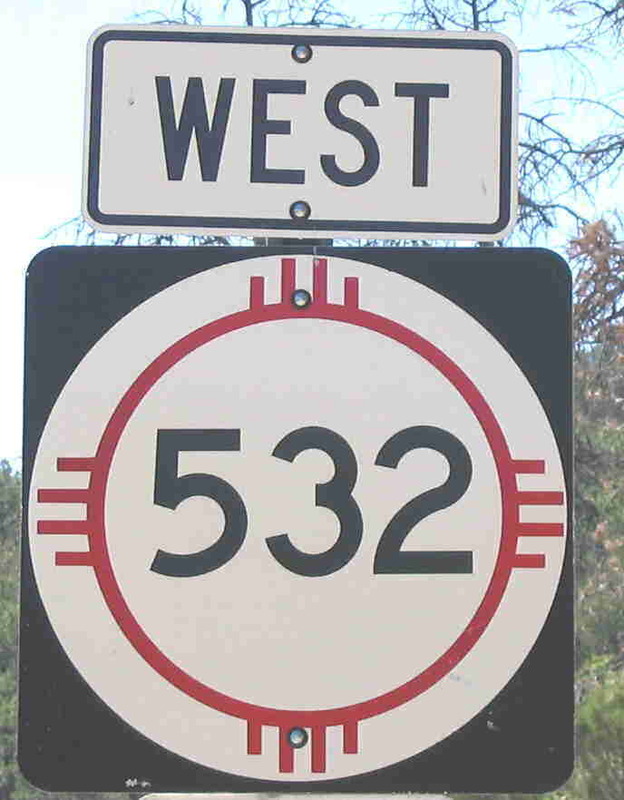 Around 2000, U.S. 550 was routed south over old NM-544 and NM-44 to Bernalillo, and this segment was renumbered NM-516. Comment: Goes north on Browning Parkway from U.S. 64 east of Farmington, then east on Main Street. Old U.S. 550 followed Main Street all the way to Farmington. History: Appears to have been established in the mid-1960s and removed from the state highway system by 1980. History: The original route of NM-3 between Las Vegas and Taos. Renumbered as part of the 1988 route revisions. 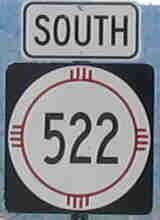 Comment: Despite the actual south end of this route, it is marked with trailblazers ("To NM-518") off I-25 at both the north and south business loop exits to Las Vegas, and via NM-329 from BL I-25. The sign at left is noteworthy because one rarely sees "BEGIN" signs in New Mexico. History: Established mid-1960s. Date at which it was truncated back to Las Tablas is not known, but was after the mid-1980s. History: Established around 1970. Removed from state highway system around 2000. Comment: Now Santa Fe County Road 99. Interestingly, this is a better road to Chimayó than the remaining state highway, NM-503. History: Established mid-1960s. Probably turned back mid-2000s as part of route swap between NMDOT and Otero County for Alamogordo Relief Route. Comment: Ken Johnson of Tularosa made me aware of this turnback, which I had already noted by its absence from the state route log but did not know the reason. Photo taken at Colorado-NM state line north of Costilla. History: The original route of NM-3 between Taos and the Colorado border. Renumbered in 1988. History: Date of establishment not known because the route runs too close to U.S. 60-70-84 to shown on earlier maps. Likely pre-1988 due to its number. History: Date of establishment not known because the route runs too close to U.S. 285 to shown on earlier maps. Likely pre-1988 due to its number. Comment: Lea Street and Happy Valley Road in Carlsbad. It is no longer marked on each end, which leads me to wonder whether this is being turned back. History: Date of establishment not known because the route is not shown on earlier maps. Likely pre-1988 due to its number. Comment: This is the road you take to visit Trinity Site, the location where the first atomic bomb was set off. The site is generally open the first Saturday of April and October, and is a worthwhile visit. Photo taken at junction NM-72. This road is an unambiguously north-south route. Comment: Road goes by Sugarite Canyon State Park and Lake Maloya, a water supply reservoir for Raton. It officially ends at the Colorado border. This would make it the only NM state route ending at the Colorado border that does not connect to a Colorado state route. In fact, the road in Colorado does not go far, appearing to end at land owned by the city of Raton for its watershed. History: Established around 1970. Extended west over former NM-46 in part when former Corralles Road was extended to I-25 and became Alameda Blvd. History: Established mid-1960s on a newly constructed roadway. Comment: Provides a directional link between U.S. 82 and 62-180. History: Date of establishment and removal from state highway system would be pre-1988 until c. 2000. Shows on the 1999 Benchmark atlas, but no other maps. The road would run basically on the south side of the Gila River from NM-92, and due to this closeness may not be shown. Photo taken at NM-48 near Alto. Comment: Serves not only the ski area, which is owned by the Jicarilla Apache band, but also campgrounds on the east side of Sierra Blanca Peak. This is the highest mountain (11,977 ft) in southern New Mexico. History: Date of establishment not known. Route marker shown only on the 1999 Benchmark Atlas, but the road is shown as a state highway on the 2003 road map. Likely pre-1988 due to route number and could be temporally related to NM-530. Comment: Leads into the Chiricahua Mountains and the Coronado National Forest in far southeast Arizona. History: Date of establishment not known - not shown on current highway log. Comment: This is the Silver City truck bypass that runs on the southwest side of that city. Dale Sanderson reported seeing this on on-line maps, and I confirmed that. It is not indicated on any printed maps that I have seen, nor the current state highway log. From the number, it would have been established pre-1988 and was most likely removed from the state highway system by the mid-1990s..
Taken May 2005 - same location as (and junction of) the NM-165 sign shown at that route's listing. History: Established around 1970, originally began at NM-44 (now NM-165). Extended over old NM-44 to NM-14 in 1988. Comment: Allows you to drive to the top of Sandia Peak (elevation 10,678 ft.), which is possible because the east side is the tilted side of this fault block mountain. Still, it's a steep climb with many switchbacks. At the top, you drive by a forest of TV and FM radio transmitter towers. This does not come out at the same point as the Sandia Peak Aerial Tramway, but there is a trail that leads to the tramway station and restaurant. Still, don't drive up expecting to catch dinner at the top. History: Date of establishment not known because route is too short to show on most maps. Likely before 1988 because of number. Comment: This is West Avenue, which of course runs on the east side of Clayton. It is not, that I can tell, part of old NM-18. History: Probably established 1980s (before 1988 because of number). Too short to show on most maps. Comment: I only know of this because of a usenet posting by Jonathan Winkler in which he described a one block state highway behind the NMDOT headquarters in Santa Fe. A search of an on-line map for the NMDOT address (1120 Cerrillos Road) showed that there were no roads behind the location shown on the west side of Cerrillos (near a cemetery). On the east side, there is a railroad track a short distance east of Cerrillos and a short street named Pen Road which starts at Cordova Road. So, it could be Pen Road. If so, it was another "orphan" route that does not connect with any other state highway. Not being on the current highway log, it is likely not a current route. History: Originally the northern part of NM-44. Renumbered in 1988 because of a short concurrency with NM-44 and U.S. 64 in Bloomfield. Became part of the realigned U.S. 550 around 2000. Comment: This was one of the less desirable outcomes of the 1988 renumbering, breaking up an important connecting route like NM-44 because of a short concurrency with a U.S. route. Since U.S. routes are not subject to the same limitation, the through route has been restored. History: Probably established 1970s. Removed from system in 2005 as part of highway swap with Otero County for Alamogordo relief route. Comment: Thanks to Ken Johnson of Tularosa for calling this to my attention. History: Probably established early 1980s, but because the route is so short and would not show on most maps it's possible it was established earlier. Comment: A short connecting route between old U.S. 85 and I-25 near the towns of Derry and Garfield. Comment: A road leading up the western slope of Mt. Taylor, that imposing 11,300-foot peak sacred to the Navajo that you see after crossing the Continental Divide. History: Probably established early 1980s after the freeway bypassed Belen. Date of removal not known. Comment: This route ran on Camino del Llano. Photo taken near west end of route (BL I-10), March 2008. History: Originally U.S. 70-80 east of Deming, established as a separate state highway in the late 1960s when I-10 was completed through this area. Appears to have been extended further east along old U.S. 70-80 in the 1990s. No history of a state route with this number found. See for details of that route.